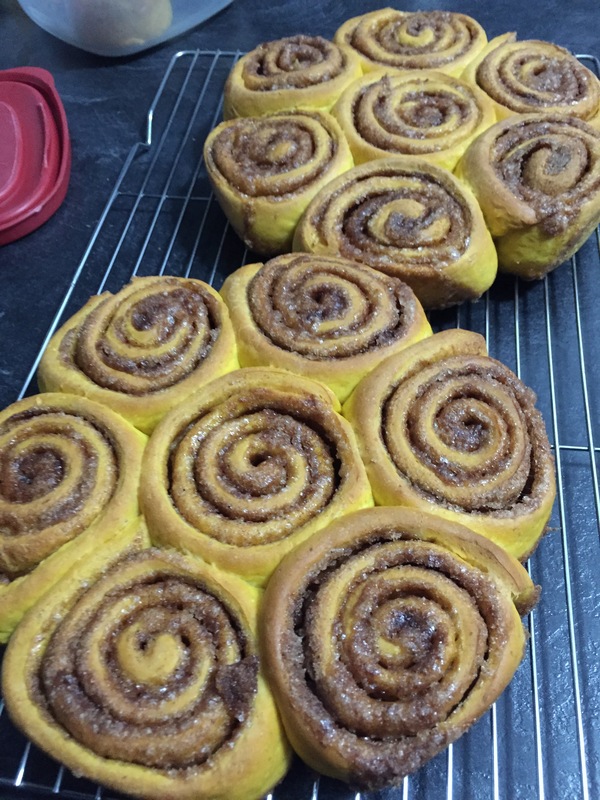 Yummy cinnamon buns! I mean really, who doesn’t love these? And then with the added twist of pumpkin its like a special fall treat! If attempting to make these, make sure you’ve got the time, as the whole process can take up to say 3 hours. Other than that, I simply say enjoy! 2 1/2 cups all-purpose flour (+extra for kneading), *you could use Bread flour if you have it on hand. Make sure the pumpkin is pure pumpkin and not pumpkin pie mix, as its not quite the same, and the results won’t be the same. In a saucepan over medium-high heat, lightly brown the butter (2 tbsp). Let it bubble slightly but don’t burn it. I like to keep stirring it slightly as I find it helps me keep an eye on it. Once it’s a nice warm brown colour remove the saucepan from the heat and add the milk ( ½ cup). Its easiest if the milk is room temperature. Put the pan back on the heat and let it heat up again. Pour the butter/milk mixture into a large glass bowl. (I find glass works best as metal bowls can sometimes leave a funky taste in bread dough, it’s a yeast thing). Making sure that the mixture it’s too too hot ( I don’t own a thermometer so I always guessitmate this part), but still warm enough add the yeast (2 ¼ tsp) and sugar ( ½ cup) and let it sit for about 10 minutes. The yeast will react with the warmth and start to froth/foam up. (Hurray for science!) If it doesn’t foam, your yeast might be old. After its all foamy add the pumpkin (1 cup), salt (1 tsp) and about half the flour (1 cup). Stir together until all the major parts are combined, and then starting adding more and more flour (about a ½ cup at a time). At a certain point stirring makes no sense and its best to wash your hands and get in there! Kneading bread dough is very therapeutic, or at least I think so! (if you need to use a bit more flour, don’t be scared to do so). Once the dough its smooth and not super sticky put a bit of vegetable oil in a clean large glass bowl (1 tbsp), form a ball with the dough and place the ball in the bowl with the oil, I usually wipe the bowl with the dough to cover the ball and get the oil on the rest of the bowl. (The oil keeps the dough from sticking to the bowl as it rises; I find it helps later on). Once it’s a big doughy ball of goodness, take off the teatowel and PUNCH IT! (honestly my fav part, it’s so satisfying). Sprinkle some flour on the counter and flop the dough on to it. Work the dough and knead with clean hands for about 2 minutes. Roll the dough out on the floured surface into a nice big rectangle. I flour my rolling pin as well, keeps the dough from sticking to it. I never measure, I just roll til I’m satisfied. (I know that’s really vague… my bad). Either way, you need a big rectangle, if I had to guess say 12 x 20 inches? Once rolled out and even cut the butter (2 Tbsp) into small chunks and lay out ALL over the dough. *you could melt the butter and brush on as well*. 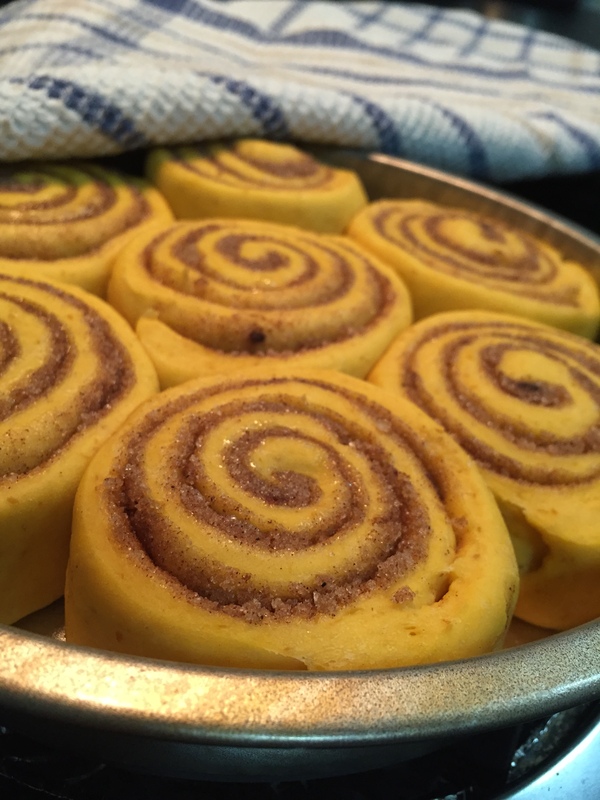 Sprinkle the cinnamon and nutmeg on the dough and then do the same with the brown sugar. 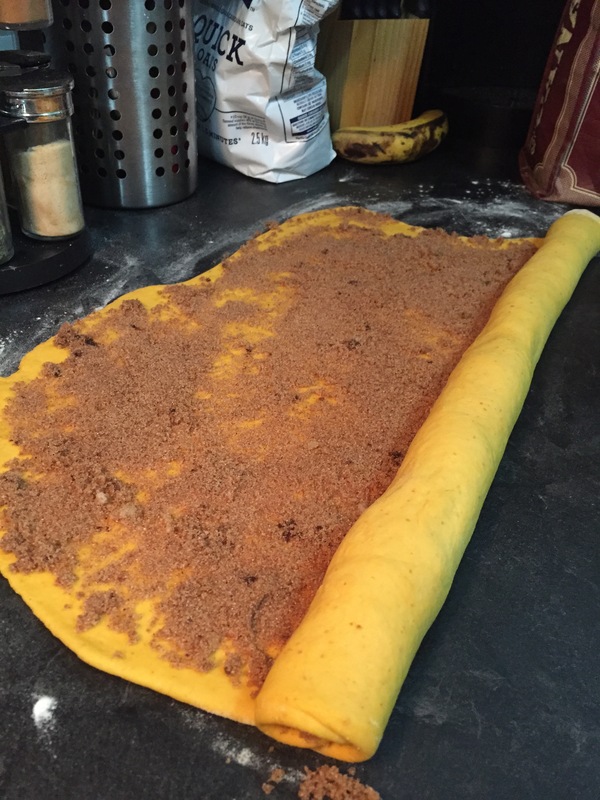 After you’ve covered every square inch of the dough with the yummy goodness, start to roll it up starting with the longest side (photo). Place them in the greased pans, making sure to leave some room (as they will continue to rise and expand). Place in a warm place again *see above* and cover with a teatowel for about 30 minutes. Just long enough for them to grow and touch each other (photo). I forgot to take a picture before they rose, but I left about half an inch in between each roll. While waiting, preheat an oven to 350 degrees. After they’re done their second rise, bake them for 30-40 minutes or until the top is a nice golden brown. Let cool, and EAT! You could also make a simple icing for these to drizzle on, but I like them just the way they are. Once cooled, store in an air tight container, and I highly recommend 10-12 seconds in the microwave when eating them the next couple of days. 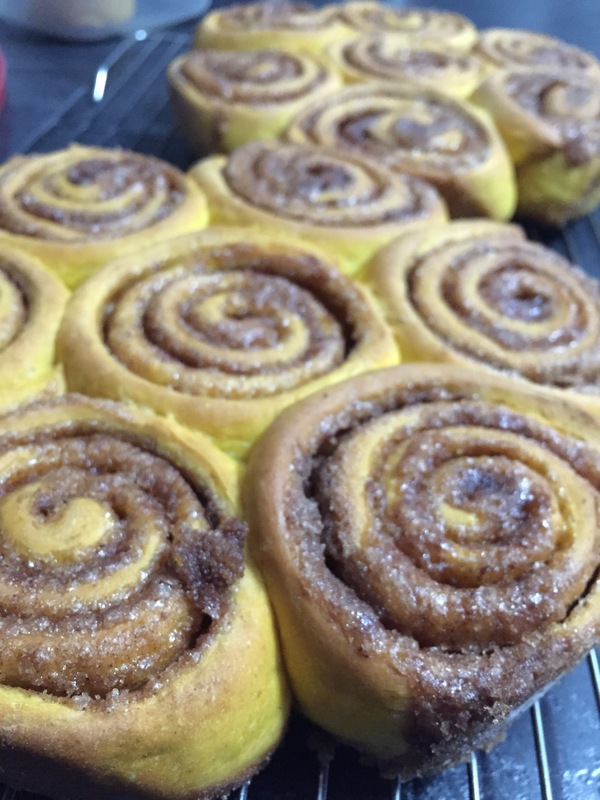 Because really, nothing is better than a warm pumpkin cinnamon bun! Enjoy!